Grilled salmon with goat cheese and blueberry sauce is one of our favorite ways to serve salmon. If you are looking for a different way to prepare your salmon, then you have come to the right place.It is Copper River salmon time in our neighborhood, which means amazing salmon at better prices. For another great salmon recipe, check this one out! Seafood is big here in the Pacific Northwest. As a child I was a very picky eater, and it was hard to get me to try salmon. Now I really enjoy it, and the health benefits are amazing. A number of years back, my husband and I were at a local restaurant down on the water called Duke’s. On their seasonal menu was a dish very similar to this. Every time my husband and I would go there, he’d ask if they could make this recipe even though the seasonal menu had long come and gone. They often had what they needed to prepare it special for him. We thought about it and figured we could surely replicate it. So, we tried and can now make it at home. 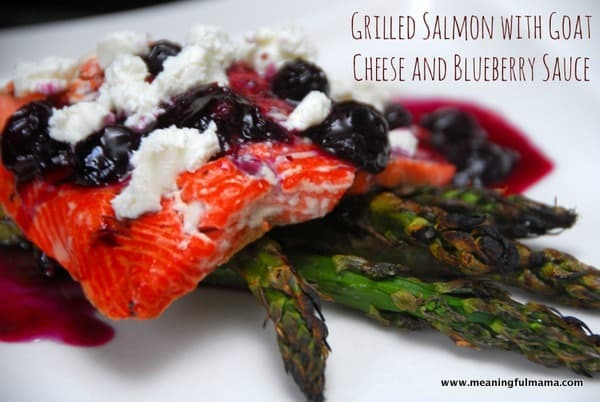 The goat cheese, sweet blueberry sauce and salmon combination is just delightful. If it sounds a bit appealing to you, then I wouldn’t imagine you’d be disappointed as you duplicate the recipe on your own. This is actually a fairly simple recipe, but will be a great way to impress your guests on the patio this summer. I like to serve it with asparagus (grilled for easy preparation) and a nice bread that is soft on the inside and crunchy crust. Rice is a nice addition too. I like to make my rice in chicken broth and then add the zest of a lemon and some thyme. Salmon – Just grill or prepare your salmon as usual. We grill our salmon on medium-high heat on foil, skin side down for 6-10 minutes. Then, when you remove the salmon from the foil, the skin comes off with the foil for easy serving and clean up. Combine all ingredients in a heavy saucepan. Bring to a boil on high heat, stirring occasionally. Once it hits a boil, reduce it down to medium-low heat and simmer until thickened, about 20 minutes. Cool slightly before pouring over salmon. Add to salmon to taste. I don’t drench it, but have it as a nice topping. I hope my picture is helpful in determining the amount. You will have left over sauce, so you could probably cut this recipe in half, depending on how many people you are serving. The recipe might be perfect for 8…that’s just a guess though. 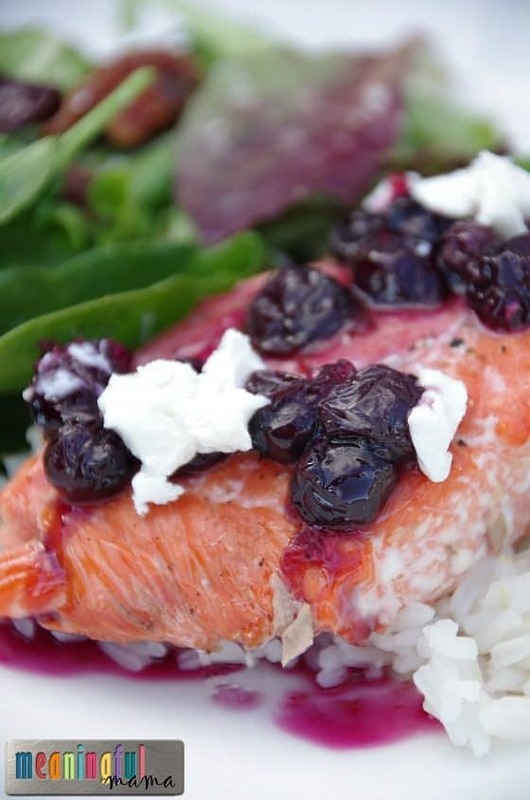 Goat cheese: Sprinkle crumbled goat cheese on top of salmon and blueberry sauce. Again, just eye ball it. You can see in my picture if you want to replicate the amount of goat cheese. I made a toasted cheese sandwich on whole grain bread with the goat cheese, blueberry sauce and some basil. Yum! For dessert, we added a bit of goat cheese in vanilla ice cream and stirred. Then, I put the blueberry sauce on top. What a unique twist to a traditional dessert. This post was originally written in July of 2013, but it was revamped and republished in June of 2017. Want another favorite summer recipe? Thank you so much for posting this. I recently moved from Seattle to southwest Florida, and one of the things I miss most about Seattle is Duke’s. I also asked for the blueberry / goatcheese salmon during off-season, and they always made it for me as well. 🙂 I am giving your recipe a try tonight! I’m so glad you found and tried the recipe. You’ll have to let me know what you think! Thanks for posting this recipe. I was searching for a recipe comparable to duke’s and this was it! Made it last night and my hubby and I spent more time saying “mmmmmm….so good” than talking about our day. I actually do not like cooking but this was so easy! Thank you Thank you! So cool! I’m glad it hit the mark. It has definitely become a favorite for us too! Thank you for commenting. Thanks so much for posting this, I love that dish at Duke’s, I will be making tonight and pinning for later use when we PCS. Thanks!! I’d love to hear your feedback after you eat it. We love it, so I really hope you enjoy it too. Thanks so much for commenting and trying. 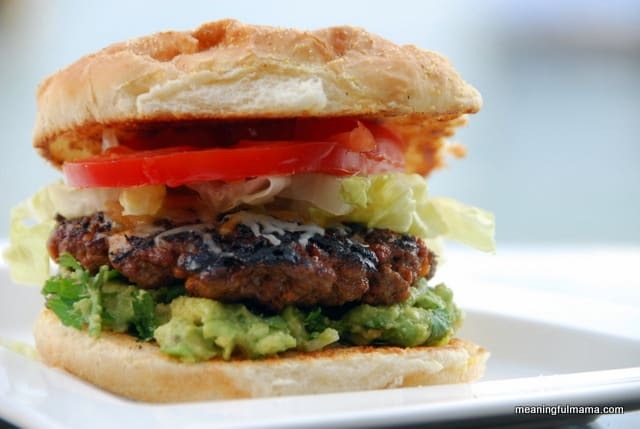 I had this served to me and have been searching for this recipe since…it is a gourmet delight. I’m so glad you like this recipe. I am thinking I would ry honey. Agave comes to mind too, but I have never worked with it. I just found this article too: http://greatist.com/health/30-sugar-substitutes-any-and-every-possible-situation. It might be helpful, but when I scanned it, nothing stood out. It did suggest lemon, which might be a great addition to the sauce. I’d love to hear what you try and what the results are like. Thanks for commenting. I am going to try cutting up Vanilla and Bluberry goat cheese (pre made in package (did not think of a receipe like this until after I went food shopping and wanted to figure out what i could do with the salmon) I am going to bake the salmon in the oven i think or i guess i could litely pan fry it. when its about halfway done put the goat cheese spread chopped up on top to melt slightly. I think it might work and pretty easy sounding Right????? Sounds good to me. Let me know how it turns out. This is one of my favorite recipes. Thanks for commenting. I too live in the Seattle area and was searching for a way to recreate the same recipe from Dukes. Thank you! After I started the blueberry sauce, I realized my salmon had gone bad. As an alternative, we grilled chicken and served it as a dinner salad with fresh spinach topped with goat cheese and the blueberry sauce. Delicious! Also, I added a splash of blackberry balsamic vinegar into the sauce and used the same vinegar to make a light dressing for the spinach. Everyone loved it! Thank you so much for sharing this. Awesome! Your adaptation of the blackberry balsamic vinegar sounds fabulous! I should try it over chicken. I just love the combination. I’m so glad you found the recipe and have been able to enjoy the results. Thanks for checking in! My husband and I just ate at Duke’s last weekend for the first time. He ordered the salmon with goat cheese and blueberries and it was AMAZING!!! He said he wished I could reproduce it at home, and so I thought I would search online. I am so glad I found your blog and this recipe, and I can’t wait to try it! Thank you so much!!! Awesome! I hope you love it. It’s one of our favorites, and I don’t think you’ll be disappointed. It’s pretty easy to do too, which is an added bonus! My wife and I ate at Duke’s and had amazing meals. We did not try the goat cheese and bluberries but did have and are going to replicate the blackberry salmon. Unfortunately Duke’s is about 1200 miles away. We share the same last name and had to try it (glad we did). Let me know what you think. We just had friends over, and one friend isn’t a fan of salmon. That said, he keeps mentioning how good this meal was, so apparently it can even go over well with people that don’t typical like the fish. I hope you enjoy it.